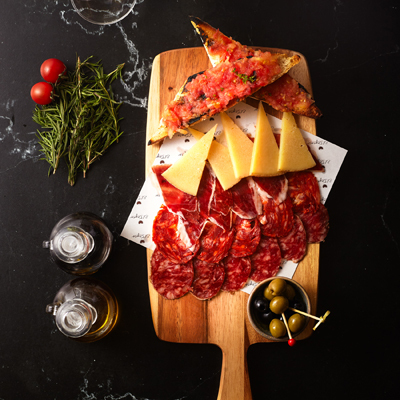 Cold cuts and cheeses are some of the most common products in every Spanish household. 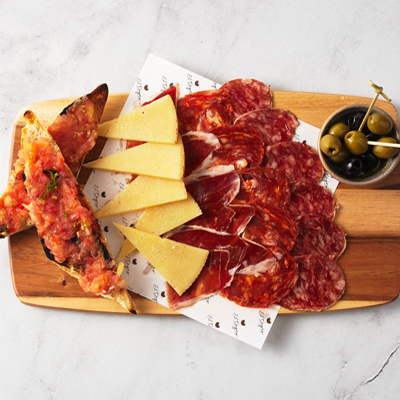 Our top quality cuts from the world-famous Iberian Pork and all our cheeses are produced in the best farms in Spain. Delicious plate of cured ham from the world-famous free range Iberian Pork. Jamón ibérico de bellota 50g. Top-notch cured ham from the very best breed of acorn-fed Iberian Pork. Chorizo ibérico de bellota 50g. Colourful cold sausage of acorn-fed Iberian Pork and Spanish paprika. Salchichón ibérico de bellota 50g. Smoked sheep cheese from the famous Idiazabal denomination, in Northern Spain. Blue cheese produced in the mountain regions of Northern Spain. Cheese platter, includes a taste of all our Manchego, Idiazabal, and Blue cheeses. Tabla mixta (ibéricos y quesos) 150g. Iberian and cheese platter, including Iberian jamón, chorizo, salchichón, and Manchego and Blue cheeses.